They call this the holiday season, but a more accurate name might be the comfort food and entertainment season. We want to enjoy and ingest everything familiar and warm and oozing with memories. If that’s sappy and corny, well so be it. Sappy and corny can be fun. And delicious. Eleven years ago, our holiday entertainment bandwidth grew a little wider with the stage adaptation of White Christmas, the 1954 movie that solidified the evergreen popularity of Irving Berlin’s holiday ballad (which, incidentally, had its premiere in and won the Academy Award for Holiday Inn in 1942, which, further incidentally, has its own stage adaptation on Broadway right now). Why limit the world’s best-selling record to one stage musical when you can have two? Anyway, the stage version of White Christmas, which added Berlin’s name to the title to create one of those awkward labeling situations (Irving Berlin’s White Christmas as if there could be any doubt), started life in St. Louis in 2000 and was revamped and retooled and aimed for Broadway (where it finally landed in 2008) with a launch at San Francisco’s Curran Theatre. 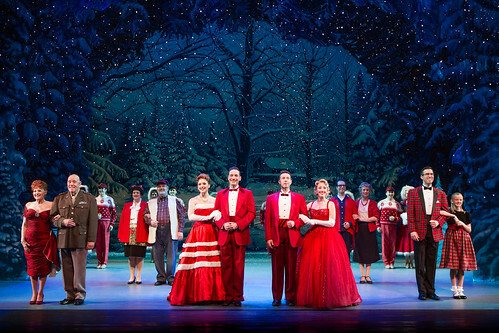 That production was pure delight, the kind of instant Christmas classic that would inevitably be taking its place alongside the Christmas Carols and Nutcrackers. 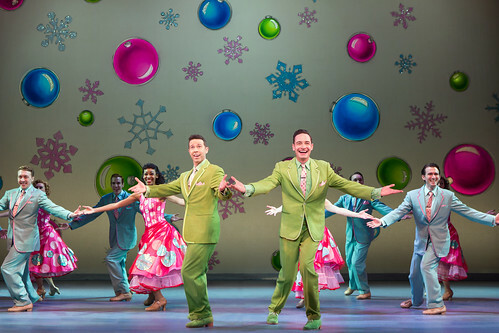 Sure enough, White Christmas is a perennial, and this year’s touring production has returned to San Francisco, only this time at the Golden Gate Theatre as part of the SHN season. Directing duties have gone from Walter Bobbie to original choreographer Randy Skinner, but this is essentially the same show with the same musical theater dazzle and same holiday warm fuzzies. It’s pretty much a can’t-miss situation from the start: you’ve got more than a dozen Irving Berlin songs tucked into a story about WW II veterans-turned Broadway stars doing a good deed for their former general and falling in love with a pair of talented sisters along the way. It’s pure 1950s movie musical fluff, and it has been adapted for the stage with a genuine love for those movies and a sharp theatrical eye that delivers on dazzle and has just enough heart to keep it from being a shiny, hollow ornament. The tour leads have Technicolor charisma. As the performing duo of Wallace and Davis, Sean Montgomery and Jeremy Benton have that Gene Kelly/Donald O’Connor vibe (I know it was Bing Crosby and Danny Kaye in the movie, but these guys are more Gene/Donald, which is great, and O’Connor was initially slated for the role of Davis but had to drop out due to illness). Benton is a mad tapper, and he gets to headline the show’s most rousing number, the Act 2 opener “I Love a Piano.” Montgomery gets the evening’s sweetest song, “Count Your Blessings Instead of Sheep.” How can you resist a lilting lullaby that encourages gratitude? As sisters Betty and Judy Haynes, Kerry Conte and Kelly Sheehan, get another score highlight, “Sisters,” and Sheehan matches Benton tap for tap on “Piano.” Conte’s big moment is a solo lounge act number, “Love, You Didn’t Do Right By Me,” and she makes it distinctive. Of course the sets by Anna Louizos are blasts of color for the big numbers and cozy Christmas chintz for the inn scenes. Costumes by Carrie Robbins feel like the big-skirted ’50s only slightly exaggerated for musical theater, and the band, headed by musical director Michael Horsley, has the percussive oomph and brassy blast when needed and a more tender side for the ballads. By the time the snow starts to fall at the finale (sorry, Spoiler Alert! ), all you really need are jingle bells because the audience is firmly in its holiday happy place, beaming in the glow of the White Christmas comfort and light. Irving Berlin’s White Christmas continues through Dec. 24 as part of the SHN season at the Golden Gate Theatre, 1 Taylor St., San Francisco. Tickets are $45-$214 (subject to change). Call 888-746-1799 or visit www.shnsf.com.